License: Free with in-app purchasing. Universal app compatible with iOS 3.1 or later. You can lock the doors. You can bolt the windows. But can you survive the night? The undead are at it again. This time terrorizing a local farming community. You assume the role of a farmer who needs to plan strategic retaliation during the day for the coming night ahead. With you are two other survivors that you must protect. Your aim is to survive 28 nights, leaving no zombie standing. To achieve this goal you are initially issued with a single gun that has unlimited ammunition. After a few nights that gun is almost useless for anything other than the most basic of the undead. As you progress through the game you will unlock additional weapons. They can be purchased should you have the correct level of in-game currency. Currency to purchase weapons is earned by killing as many zombies as you can. Each kill is allocated a certain amount of coins in order to upgrade current equipment. There is also in-app purchasing should you wish to simply pay for the upgrades rather than earn them. 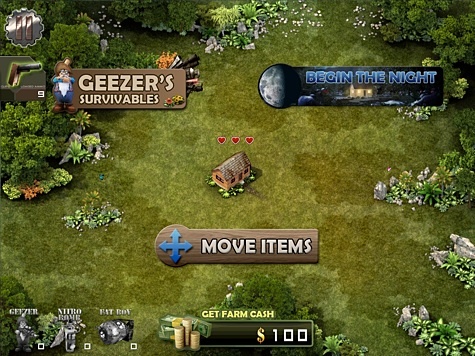 The developer has chosen to cap in-app purchases to be US$39.99 for unlimited access. I feel this is reasonable and not nearly as disappointing as the price gouging from in-app purchases found in others games such as Food Fight. One area did concern me. Selecting an in-app purchase did not initially inform me of how much it cost in US dollars. It did detail the amount of “Farm Dollars” I would receive. I felt this was a little deceptive and could possibly cause confusion amongst gamers. You can play the game adequately without making a financial outlay. In many cases you will need to replay previous nights in order to earn enough money to purchase all the items you need for a successful night. You can also earn free farm cash by posting to Facebook and Twitter from within the game. Tapjoy.com integration has also been included. Besides weapons, other in-game items include bombs, mines, plants, animals, fences, and additional lives, to name a few. Not all of these are available from the start of the game as they will be unlocked as you proceed. These products will assist fending off the hordes of zombies that want to attack your isolated farmhouse. During the day you are welcome to move the obstacles around the farm yard in order to prepare for the night ahead. You can also sell the items if you feel that they were previously inadequate in stopping the oncoming onslaught. Albeit for a fraction of the original cost. 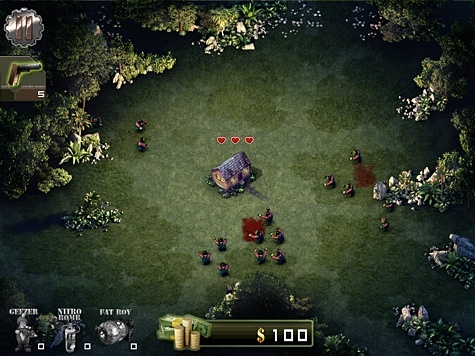 As with any strategy style game you will need to choose your weapons and additional defenses carefully. Selecting a poor combination can result in your total inhalation. The game allows you to dictate when you will commence the night. This technique may work well for a casual game but an automatic time swap would have brought much more anxiety and edge of your seat excitement. As you enter into night the soundtrack moves from a upbeat country guitar strum to a world of frightening sound effects which include monsters and zombies. The gameplay is rather simple yet challenging. Tap on the zombies when you see them appear from the bushes. As you do this, shots will be fired from your weapon of choice and if chosen correctly will kill the zombies. As you can own multiple weapons you are also able to switch between them mid game. This will provide you with a challenge as some weapons pack a punch but have a limited supply of ammunition. All weapons will automatically reload but you can also manually undertake this task. Should you fail to make it through the night you will be given the option to retry or go back to day mode and once again plan your approach. This non judgmental approach to bad planing will appeal to many casual gamers. I feel the game could have had difficulty levels allowing the more serious gamer a long term challenge. As a universal title I was able to enjoy the game on both the iPhone and iPad. It is a much better experience on the latter as the graphical view of the game is an angled top down view of a wide area. This didn’t make the game unplayable on the iPhone but your enemies were much clearer on the iPad screen due to the increased size. The developer has also added the option of iCloud support for game files and progress. The advantage is that should you need to restore your device you can always access the saved file to use again. A glaring omission is compatibility with Game Center for achievements and ranking amongst other players. If this was implemented in future editions it would encourage replaying of the game once it is initially mastered. Overall the game was enjoyable and challenging to play. Whilst the game is better suited to the iPad-sized screen you will not be disappointed if you only play it on the iPhone or iPod touch. Either way, when the lights go out you are going to run around like a headless chicken trying to defend yourself and your survivors. 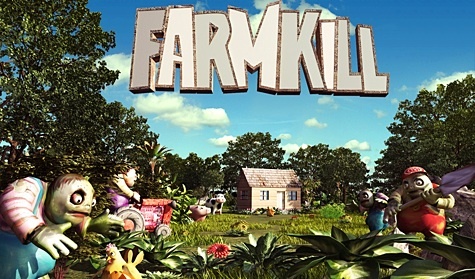 Therefore, I am awarding Farmkill a MyMac.com review rating of 7 out of a possible 10.